Cooking onions very slowly brings out their natural sugars, and then those sugars caramelize. 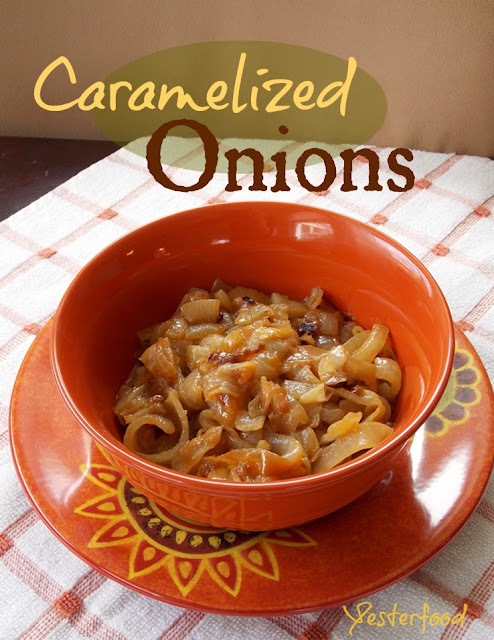 The caramelization process results in richly-flavored, slightly sweet, mellow onions that are delicious in many different dishes. Caramelized onions are not difficult to make, but they do take a little while- anywhere from about 45 minutes to an hour. They are worth the wait. My favorite way to enjoy caramelized onions is piled on top of a grilled-outside-on-the-grill hamburger or tucked inside a melty quesadilla. My husband likes his caramelized onions with a steak or on a baked potato. They're also great in soups, sandwiches and wraps, and on pizzas or hotdogs. Slice off both ends of the onions, then peel the onions. Cut them in half from top to bottom. Place the onions cut side down and slice into half-rings, no thicker than about 1/4". Separate all the half-rings into individual pieces. Over medium heat, melt butter in a large skillet. Watch it closely so that the butter doesn't burn. Add the onions and stir to coat. Add a pinch of salt unless you used salted butter. A pinch of sugar will help the caramelization process, but is optional. Over low heat, and stirring frequently, continue to cook the onions until they are a rich, dark, golden-brown color. Caramelized Onions may have been taken to some of these fun parties! I have a secret love affair with caramelized onions. Shhh..... don't tell my husband, lol. Thank you for sharing with Simple Supper Tuesday! I am visitng through Simple Supper Tuesday linky party. I have never made carmelized onions and your picture is so beautiful I decided I would give it a try! Definitely one of the best add-ons to just about any savory dish! Your recipe is so simple and uncomplicated - love it :-) Thank you for sharing at our ALL MY BLOGGY FRIENDS party, Joy! Yummy! Seriously, I could eat caramelized onions by themselves! Jamie, I could, too! ;) Thank you for visiting! I love caramelized onions! You're inspiring me to make a big batch and save them for future uses (to save time). Have you tried freezing them? I just found your blog for the first time. You might enjoy this family-food story: my family's hazing vegetable. Becca, I look forward to reading your food-family story! I have not tried freezing them....they are always gone too fast. I can’t think of why they wouldn’t freeze well, though, can you? *Might* affect the texture somewhat? If I try it, I’ll let you know, and if you try it, please let me know! Thank you for coming by- so nice meeting you! 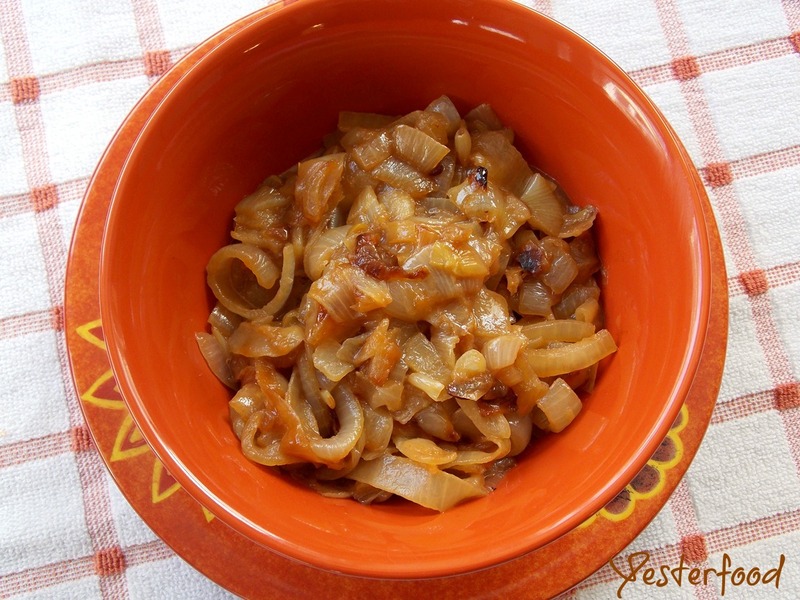 Caramelized onions are my absolute favorite!! I used to work in a restaurant where we would caramelize the onions on our fajita plate. It made me drool every time. Thank you so much, Nantawan! I am following you back! These look so good! It is finally starting to be grill-worthy weather here in PA, and these would go perfectly on top of a burger. :-) Thanks so much for linking up with "Try a New Recipe Tuesday." I hope you will be able to join us again this week. Love caramelized onions. Pinned it for my followers to enjoy. Thanks so much for linking up at: Swap N Share Sundays. Mmmmm I love caramelized onions on homemade pizza. *Drool* found you over on Bobbi's Kozy Kitchen linky party. Your caramelized onions look so good. For some reason, I am never patient enough when I make them. I always end up turn the heat up. And they are never as good as they could be. Thanks for sharing at Saturday Dishes.